The idea that music soothes the beast is not a new concept; nor is the idea that music impacts human emotion. Mothers sing rhythmic songs to their newborn babies, babies are rocked back and forth creating a hypnotic rhythmic pattern. Babies rock themselves in their cribs to create that same rhythmic pattern. Many experts and laypersons in today’s society suggest mothers play music for their unborn children. Native Americans use music in their healing processes. Restaurants, stores, and elevators use music to entice the listener. And in Your Playlist Can Change Your Life: Ten Proven Ways Your Favorite Music Can Revolutionize Your Health, Memory, Organization, Alertness and More, music as a method of healing and enhancing moods is custom made for you. Dr. Mindlin, Mr. DuRousseau, and Dr. Cardillo, three internationally renowned brain scientists, have taken the idea that music does have a positive effect on one’s life and provide a guide for how to create your own playlist to bring about life changes. The credentials of these three authors are impressive and speak volumes about their intent. Their book is not a scholarly work nor is it just a how-to book. 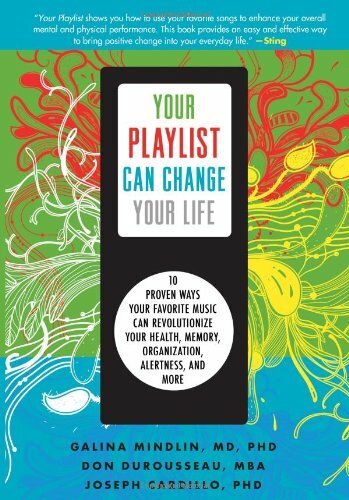 Your Playlist Can Change Your Life gets the reader-learner directly involved in the processes of choosing and then using music to enhance your life. A few chapter titles will illustrate the range of instruction: How to Use Music to Make Your Mind Flow, How to Use Music to Alleviate Anxiety, How Music Can Sharpen Your Memory, and How to Use Your Brain’s Own Music. Each chapter contains useful tips and music suggestions. Dr. Mindlin, Mr. DuRousseau, and Dr. Cardillo make Your Playlist Can Change Your Life worthy of your attention. Norman W. Wilson, Ph.D., Professor Emeritus Polk State College, has taught an array of subjects, including literature and artand music criticism, and has published several college textbooks.